The TADWA-developed Bin Tippers are now in operation at Good Samaritan Industries where they are providing a safer way of unloading clothing bins for sorting. 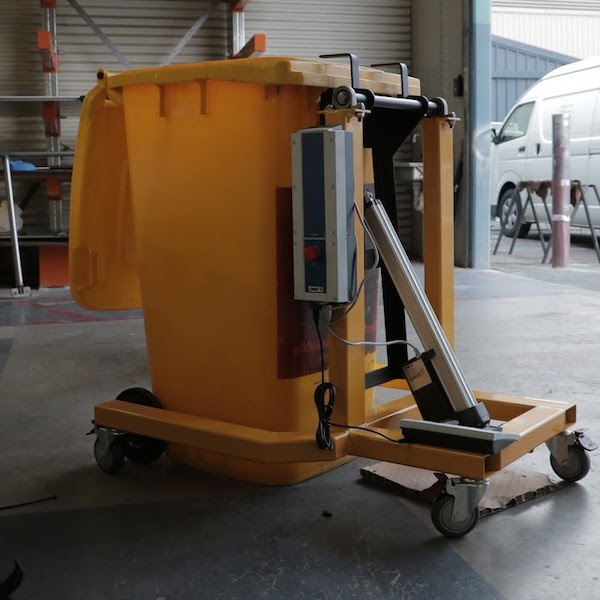 Designed by TADWA’s Custom Solutions team and prototyped with Good Samaritan Industries (GSI) over the past twelve months, the order of ten battery powered bin tippers is the first of what we hope will be a solid market for these labour saving devices. The Bin Tippers utilise a foot pedal-operated linear actuator to lift and tilt the bin into position over the sorting bench, eliminating the physical labour involved in manually lifting the bins. This is both a productivity and safety benefit which GSI was seeking. Projects like this enable TADWA to expand our capabilities and engineering expertise, which is then available to apply to custom solutions for people with disabilities.